Bees evoke fear whenever they are too close. Being stung is not a pleasurable experience. It is a potential hazard that goes along with gardening. While I do what I can to protect myself and be aware, the eventual sting happens. The pain of the sting makes me wish bees didn’t exist. Then I remember how important they are to the landscape. Beautiful flowers and plants would not flourish without them. Plus we can’t forget about honey; a wonderful natural sweetener that is so versatile in the kitchen. It’s an ingredient in these braised fall greens with apples and many other recipes. Honey is the focus of a new cookbook. A copy of it recently arrived at my door. I was excited to see it because I’ve been a fan of cooking and baking with honey for a long time. The Fresh Honey Cookbook by Laurey Masterton highlights various types of honey and showcases them with seasonal recipes. Long ago I only used store-bought honey. It was before I discovered the incredible flavor of local honey. My main source now is from a beekeeper only a few miles from my home. Then I discovered more varieties as I traveled. It’s amazing how each area can yield such different flavors and colors. You can see examples of the color range in the book. Colors go from light wheat to dark brown. A few notes on the recipe. Below is as it appears in the book (used with permission). I had to use a 7-quart pot because three pounds of greens would not fit into my largest skillet. 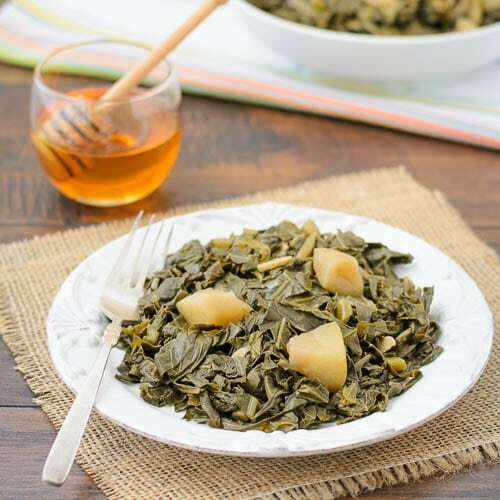 I used a mixture of pre-washed and pre-cut collards and turnip greens. They took about an hour to simmer before they were tender enough. My southern soul was skeptical in the process. I’m used to greens being cooked with pork for hours. However, I was pleased with the final result. I ate a big bowl for dinner and enjoyed the simple flavors of the greens and apples. A recipe for braised fall greens with apples. Turnip, kale, collards, and/or mustard greens are braised with honey, garlic, onion, and apples for a delicious side dish. Heat the oil in a large skillet over medium heat. Add the onion and garlic and sauté until they start to brown, about 5 minutes. Add 1/2 cup water, and the vinegar, honey, and apples, stirring to combine. Add the greens and stir, folding in the uncooked greens on the top as the ones in the bottom of the pan wilt, until all the greens have been incorporated. Lower the heat to a simmer, cover, and cook for 5 to 30 minutes, depending on the age of the greens. If the greens are young, they will only need to cook for 5 minutes. Older greens, like a mix of mostly collards, will need to cook longer. Taste and add salt and pepper to your liking. A pinch of salt and a grind of pepper will do the trick. Too much more will mask the sweet flavor of the greens, so do taste them first, okay? Splash with a big more vinegar and one more drizzle of honey, and serve. Excerpted from The Fresh Honey Cookbook (c) by Laurey Masterton, used with permission from Storey Publishing. Disclosures: I received a copy of The Fresh Honey Cookbook at no charge from Storey Publishing. I was under no obligation to give a positive review. All opinions are my own unless stated otherwise or contained within a guest post. The post contains affiliate links. You managed to make a plate of collard greens look good Renee! Very interesting recipe adding a little sweetness to them. There was a time when I had honey on whole wheat toast every single morning, and got so cranky if I run out of it! It’s one of my absolute favorite ingredients, especially for baking. They do sell eucalyptus honey here, and I think it’s the first time I see a recipe with it. Thanks so much Paula for your kind words on my photography. The sweetness of the honey really works with those greens too. Some can be a little bitter and it really balances it out. I’ve recently gotten hooked on raw honey and use it all the time in recipes. 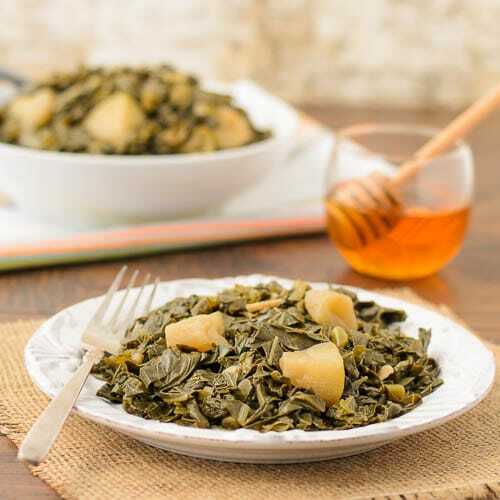 I’ve never cooked collard greens before but I’ll bet they’re very tasty with a little honey and apples. Very seasonal! Thank you so much for featuring this on your facebook page. I already liked your page a while back and have been following it. I do enjoy greens very much. Just discovered you through Twitter. Love southern food now that we just moved to south Illinois! Great sweet idea to get my kids to eat greens. Thanks Serena and I’m so glad you found my blog. Please come back and visit often! Thanks Kim and the honey does add a nice touch of sweetness to the greens. I have not baked with a lot of honey and I think this dates back to some really awful honey cakes when I was young. Step by step, I am starting to appreciate it more as an adult and am always interested in learning about how one kind differs from the next. Those honey cakes must have been awful because most cakes baked with honey are so good! I love the rich flavor from it. I’m glad to see you are now using it and learning more about the different varieties.